Skip Jones is the Deputy Assistant Secretary for Trade Agreements and Compliance. 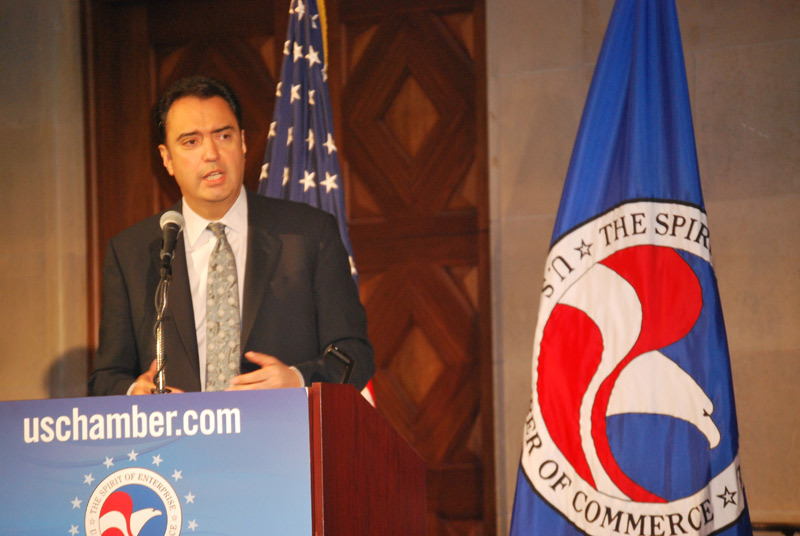 Assistant Secretary Michael Camunez delivers keynote speech at the Defeating Foreign Trade Barriers Workshop at the U.S. Chamber of Commerce. U.S. products are the most sought-after products in the world. However, U.S. companies sometimes have problems selling their products abroad. They encounter various foreign government-imposed trade barriers such as unfair technical requirements, discriminatory government procurements, or unfair customs valuation practices. In many cases, these difficulties represent a country’s not honoring its trade agreement with the United States. To address these difficulties, the U.S. Department of Commerce operates the “Trade Agreements Compliance Program.” Representatives from the U.S. Department of Commerce, the Office of the U.S. Trade Representative, and the U.S. Chamber of Commerce offered participants expert advice at a “Workshop to Defeat Foreign Trade Barriers” in Washington, DC, and explained how to take advantage of this free Commerce program. The day-long event was organized by the National District Export Council and the U.S. Chamber of Commerce. It featured numerous panels, roundtables and keynote addresses. The speakers discussed current trends in foreign non-tariff barriers, and the government programs and policies available to combat them. In addition to Under Secretary Sánchez, over 30 speakers offered their insight to the participants – among them, U.S. Trade Representative Ron Kirk, Assistant Secretary for Market Access and Compliance, Michael Camuñez, and Acting Assistant Secretary for Trade Promotion and Director General of the U.S. & Foreign Commercial Service, Ambassador Chuck Ford. U.S. companies are highly successful in international markets, if they can compete on a level playing field. Efforts like today’s workshop, as well as the underlying work of all U.S. government agencies, help ensure that is the case. If your business encounters a trade barrier, please visit http://tcc.export.gov/Report a Barrier for assistance.